By Jason Beale - posted Wednesday, 14 November 2018 Sign Up for free e-mail updates! John Gray, the English political philosopher and cultural polymath who turned 70 this year, has just published an interesting article at unherd.com, titled 'How the liberal West is dismantling itself.' Like a scary post-millennial bedtime story, he gives a diagnosis of the "collective malady" of liberalism that he sees sweeping Western societies. For all his erudition, however, Gray's reductionist view of history does some disservice to the complexity and ambiguity of Western art and culture, and ignores the richness and ongoing strength of the Humanist tradition. In making his argument he conflates various cultural and political movements to explain a contemporary crisis of Enlightenment values. He starts with the inimitable Marcel Duchamp and draws a line joining Romanticism, Dada, Futurism, Fascism, and Communism. By doing so he conjures up a trajectory of "antinomian" rebellion that rejects the authority of traditional values, substituting in its place a cult of the will. This leads towards what Gray describes as the "unfettered autonomy" embodied in 21st century liberalism of the social or progressive kind. He uses the example of identity politics to illustrate the current misguided belief in self-creation with no restraints. The underlying assumption is that the Western faith in reason to liberate humanity has lost its underlying authority, and now we are free-floating down the rapids, possibly towards Niagara Falls. The loss of religious certainty, the inability of Humanist reason to provide a moral grounding, and the gradual decline in Western political power, together mean the end of universal Enlightenment values. You could say this is the end of history, not in that liberal democracy has finally triumphed, as proclaimed by Francis Fukuyama, but in that history is directionless, and nothing guarantees the development of human freedom in the long-term. In response, there has been a desperate attempt by 21st century liberals to hold onto the moral high ground, promoting autonomous self-creation as the highest social good. However, for Gray this is impossible since there is now a "cultural vacuum" at the centre of Western societies, and a hollowing-out of meaning. An alternative response has been the rise of populist political movements around the globe, since according to Gray, "humankind cannot bear very much autonomy." Two extremes facing off, across the limp body of the Enlightenment. Although he is known as an anti-humanist and an atheist, Gray seems to lament the vandalism of traditional values taking place in the social and cultural sphere. At one point he paints the rejection of social traditions by "exponents of deconstruction" as the nihilistic worship of 'anomie' in the name of 'true freedom'. They arrogantly use critical reason to "dismantle ideas of family, nationality and religion" with a missionary zeal he sees as typical of the West. Gray scathingly describes such progressive ideologues as "a lumpen-intelligentsia (which) aims to erase the central traditions of the West while knowing little or nothing of their fellow citizens who still live by them." Gray is definitely correct in identifying a rise of intolerance from left-wing activists and intellectuals towards ordinary working people, who have no urge to transform society, believe in hard work, are happy with two genders, and are busy maintaining the virtues of family, country, and even some kind of spiritual faith. You would almost think Gray is on the side of the 'deplorables' who brought Donald Trump to power exactly two years ago. However, he clearly warns against populist movements and the "the dangerous allure of would-be dictators, which is gripping hollowed-out liberal societies throughout the world." He concludes by stating that "the collective malady of western societies . . . has brought them to a point at which their defining project is dismantling themselves." Although Gray does an excellent job of wielding an intellectual armory steeped in post-millennial fear and trembling, we should remember the words of Scarlett O'Hara: "After all, tomorrow is another day!" The structures of liberal Western democracies continue to function, and the people within them continue to thrive. Children are born, people love their homes and their homelands, and all of us must face the question of ultimate meaning in life and death. Of course, there are clearly changes happening in Western societies that are cause for concern. Changing demographics have over time caused seismic shifts in our communal lives, and the shared understandings that bind us together as a community are no longer easily taken for granted. In the United States there are severe challenges to the so-called 'civility' of politics and community itself, as people come to terms with a president who is unafraid of challenging liberal shibboleths. From what I have sampled of his work, especially in the book Straw Dogs: Thoughts on humans and other animals, John Gray is profoundly sceptical of Humanist ideals, especially the notion of 'progress', and is quite pessimistic regarding the future of Western societies. He argues that the rise of identity politics will fragment social unity, while unrestrained immigration will continue to divide communities and encourage right-wing extremism. The West is in decline and our attempts at exporting democracy, as previously in Afghanistan, have failed pathetically. Gray offers an amusing story of an English art teacher in Afghanistan lecturing local men and women about conceptual art. As can be seen in a YouTube clip, she shows them a slide of the infamous urinal of Marcel Duchamp of 1917, and elicits only embarrassed and confused looks. But Gray omits to note that most Westerners would have the same reaction. 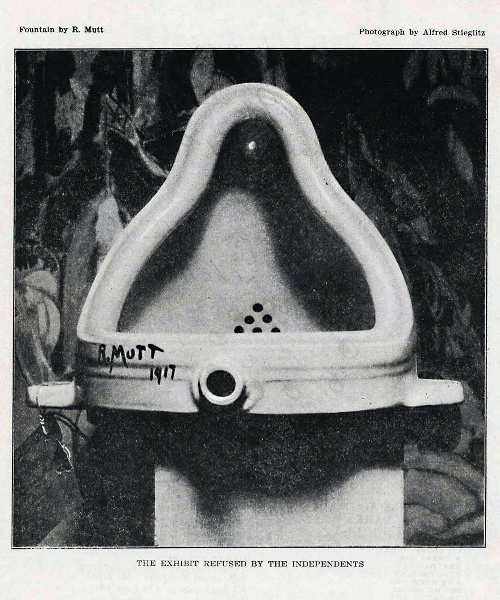 Duchamp's Fountain is not the wrecking ball to artistic tradition Gray takes it to be. If anything the irony and humour of Duchamp is heir to no less than Cervantes and Laurence Sterne, and a key to the critical self-awareness of the Enlightenment tradition. The ability to laugh at ourselves is the ability to both subvert and affirm what is meaningful and sacred. This is something we find lacking in many non-Western cultures around the world. Thinkers such as Gray provide one way to make sense of current trends in society and culture. His densely argued and detailed commentaries have been widely read, but the extent to which we can read the future from the entrails of dead philosophers and art movements remains to be seen. The very complexity and inconclusiveness of his ideas makes them less influential and motivating, than the more direct and grounded homilies of a public intellectual like Jordan Peterson.